In the summer of 1917, when my grandfather, Lowell Townsend Copeland, was not yet 17 (he was born December 21, 1900), he took a trip out west. I have a set of 27 photographs that were taken during this trip, and they are all labeled on the back (likely Grandfather's handwriting). I will share a few each day for the next few days. I don't know who Mr. and Mrs. Sidley or Miss Holt are. I know the head is partially cropped in the following photo, but it is the only closeup photo in the collection of Bill Sidley, who looks like he might have been grandfather's age. L.T.C. [Lowell Townsend Copeland] and Bill all ready for a day of fishing. L.T.C. 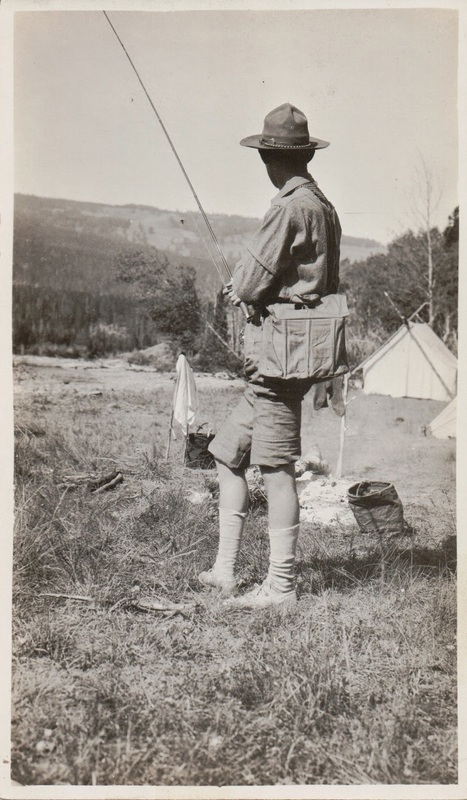 [Lowell Townsend Copeland] in his fishing outfit with his rod. See Grandfather Out West Photos #2. See Grandfather Out West Photos #3. Elizabeth -- I love old photos like these. What a great photo series. Thanks for sharing. I am wondering, was your grandfather a Boy Scout? The photo of LTC and Bill sure looks like two young men in a Scouting uniform of the period -- campaign hat, neckerchief. . . The only thing missing is any kind of patches on the shirts. These are wonderful photos! I agree with John's question regarding whether or not your grandfather was a Boy Scout. What an adventure this must have been for your grandfather! Jana, No, I don't believe he was ever a Boy Scout. And yes, this must have been quite a fun adventure for him. Thanks for the mention. I have now gone back and added links to the next posts here. There are a total of three blog posts of photos. I so love these photos! What a great treasure. So much history and nostalgia. I wish I had known my grandfather better - he died when I was nine. It would have been fun to show him these photos and get the stories behind them!